No matter how big your star is, you’re probably going to have to play second fiddle as a bridesmaid at your non-famous friend’s wedding. That means desaturating your vibe if you’re Lady Gaga, coming out of hiding if you’re Taylor Swift, and bowing down if you’re Beyonce. Being in a bridal party is a big equalizer, although I have to wonder, is it worse if you’re used to being the center of attention? Because my God, I can imagine there’s nothing more (de)humanizing than being a multiple Grammy winner and having to hold your friend’s gown while she pees. 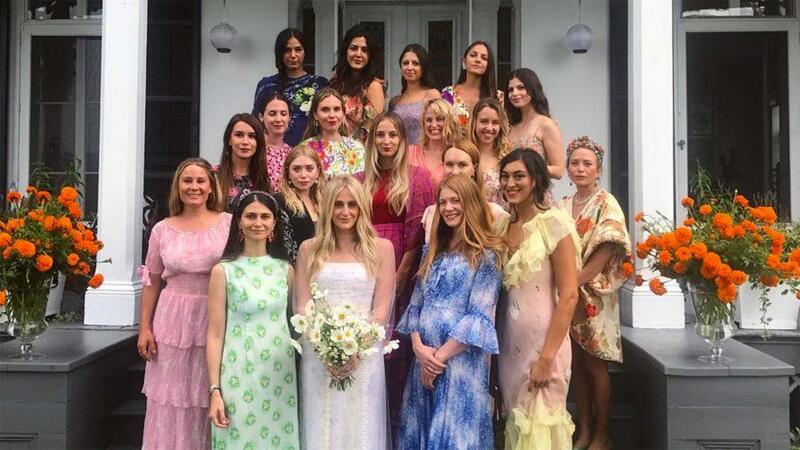 Because we’re all in this together, here are a handful of celebrities who served as bridesmaids and lived to ‘gram the tale. 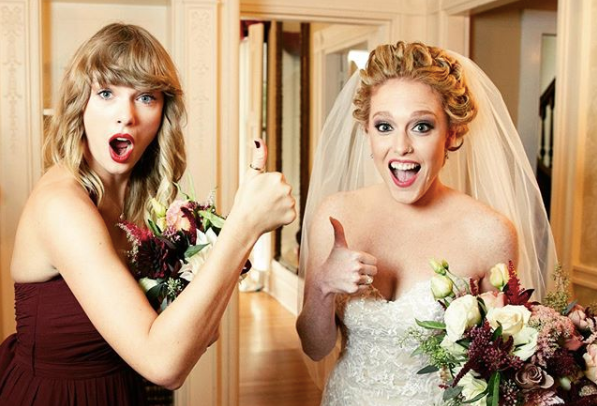 Taylor Swift has played bridesmaid twice for two members of the OG squad, AKA her normie BFFs. First, she played maid of honor to Britany Maack in 2016. Taylor was spotted taking her longtime friend to Reem Acra to buy her a wedding gown, which is definitely a perk of making your celeb friend your MoH. "Reem does the most amazing bridal designs, and Britany and I were looking through Vogue, and she pointed to this one gown, and I was like, 'I wonder if we could go to the showroom...'" Taylor told People at the time. 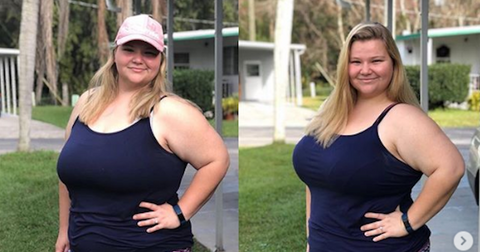 Next up was Abigail — Yes “Abigail gave everything she had, to a boy who changed his mind” Abigail — Anderson’s wedding in 2017. A little before Reputation restored her, well, reputation, Taylor was fielding boos from passersbys during the ceremony. All things considered, maybe braving the public eye post-Snakegate was a bigger act of kindness than buying a Reem Acra dress. On the other hand, Taylor, it’s not your day, geez! Even with her classed-up Tony Bennett-loving look of today, I’d be hella frightened to have Lady Gaga upstage me at my wedding. But even back in 2013, Gaga was able to shelve the meat dresses and slaughtered Kermits when her old-time friend and personal chef Bo O’Connor tied the knot. She stuck to the peach-y dress code and everything! Bless! Then, not only did Gaga play along in lavender at her best friend’s 2015 nuptials, but she played along with a totally pedestrian Insta of the bachelorette party. “Drinks ladies,” she captioned the shot, with all the basic swagger of your cousin Caitlin. 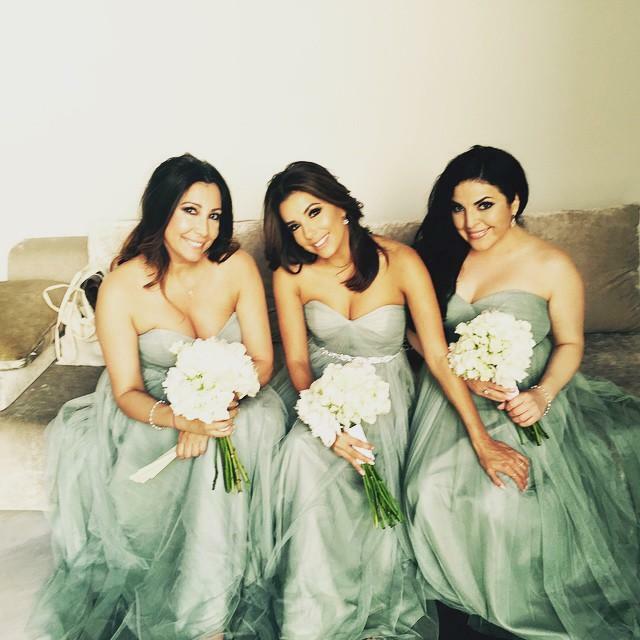 Eva Longoria looked almost infuriatingly good at the wedding of her friend Alina Peralta. It probably helped that she was put in a seafoam Jenny Yoo dress (“ciel blue” is the formal name) instead of the typical horrendous eggplant gown. Rihanna, another bridesmaid two-timer, doesn’t play by the rules quite as much. Sure, she looked cheery at her best friend’s wedding in Barbados this year, donning those stupid silk robes, dodging the bouquet, et al. But in her assistant’s bridal party in 2015, Rihanna took FULL center stage by smoking, fist-pumping her bouquet, and breaking out the lilac lipstick to match with her gown. Look at that effing picture. I’m having a hard time believing that it’s not Rihanna’s wedding with how much she’s taking the spotlight. UPDATE: I just looked at the photo again and Rihanna's bouquet is LITERALLY HIDING THE BRIDE AND HER FIANCÉ in the background. Amazing. 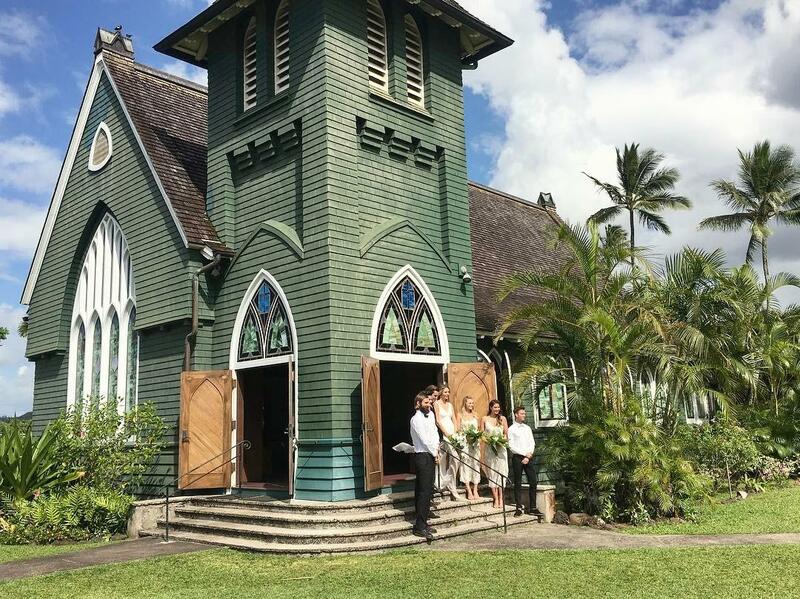 Margot Robbie kept it pretty low-key when she married Tom Ackerley in a secret ceremony back in 2016, keeping the guest-list to a very concise 50. Flashforward a few months and she looked very fashion forward in a Zimmermann slip dress when her friends Julia Koenig and Nicholas Chalmers got married in Hawaii. Who would be ballsy enough to make Beyonce a bridesmaid? Well, Tina Knowles can probably pull that kind of power move having, you know, given birth to her. 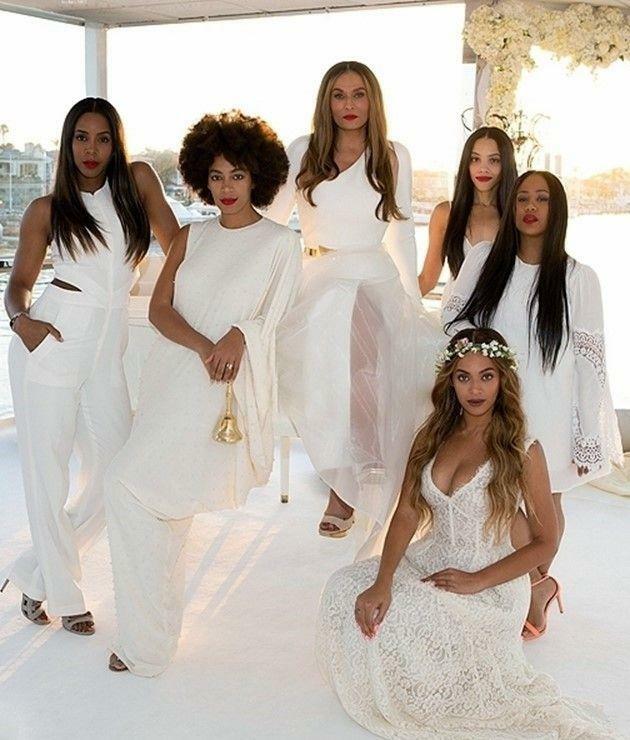 When Bey’s Destiny’s Child comrade Kelly Rowland uploaded a picture of the bridal party, the ladies were bathed in a heavenly glow of white. Must be a trend for this family — Solange did the same thing for her wedding. We’ve gotten used to Emma Roberts taking on HBIC roles, from Chanel #1 in Scream Queens to American Horror Story’s viciously quoteable Madison Montgomery. 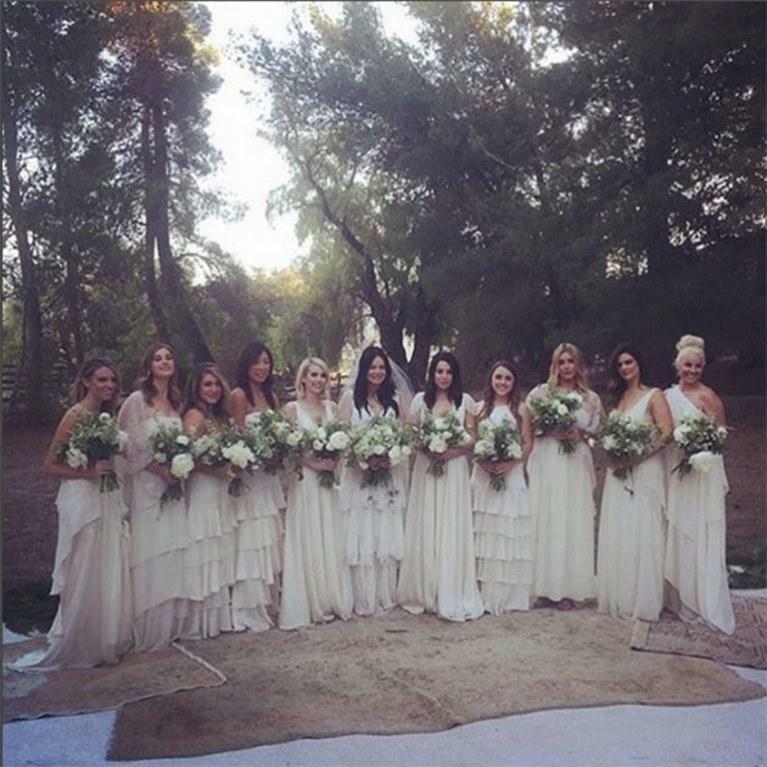 But Emma was able to take a step back as one of fashion designer Kara Smith’s ten bridesmaids back in 2015. In fact, she was even willing to split maid of honor duties with Brit Elkin! Madison would never. If a High School Musical reunion never comes to fruition, we can at least go to sleep peacefully knowing that Sharpay and Gabriella are best friends. 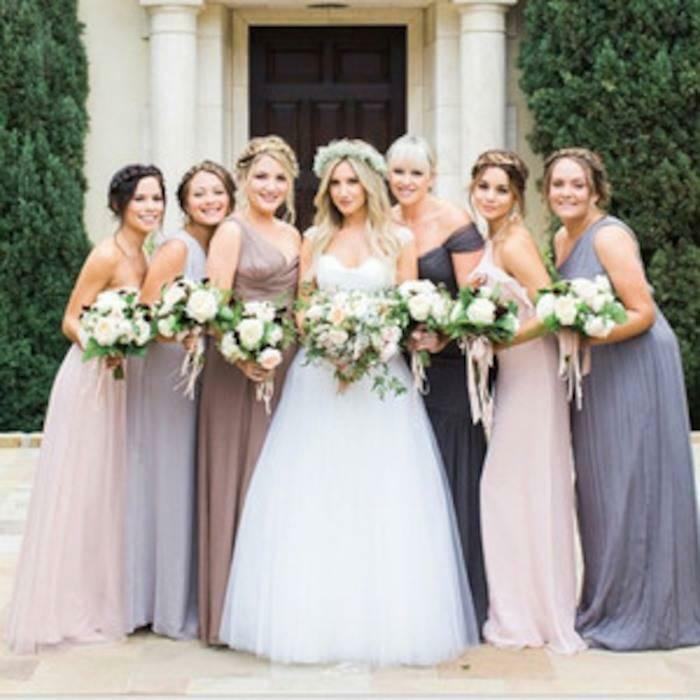 In fact, Vanessa Hudgens served as one of Ashley Tisdale’s bridesmaids, and got more than a little verklempt at the ceremony. "It was so beautiful!" she told US Weekly. "I bawled my eyes out." 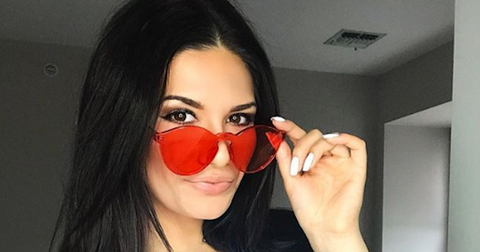 Before getting hitched to Joe Manganiello, Sofia Vergara served as a friend’s bridesmaid, and even ‘grammed the entire experience. From what I can tell she had a gr8 time eating wedding cake and rocked a gown that seems to be...Buttercream? Faded Banana? Canary Dipped in Milk? I don’t know, describing all these non-colors gives me a headache. I know, I know, lumping Mary-Kate and Ashley Olsen together is probably bad form in 2018, especially when Mary-Kate is the stand-out star in this aggressively floral party. Seriously, in a band of what looks like 42 bridesmaid, MK pops out in her enormous kimono and silk emerald green shoes. 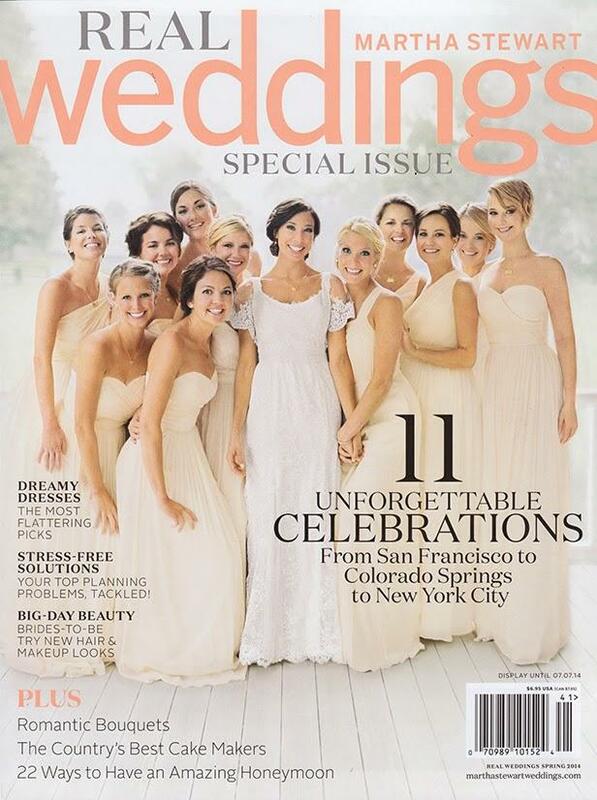 Apparently Cassie Coane did a classic “cool bride” move and allowed her maids to wear WTF-ever, as long as it was floral. A risk that worked...? Maybe? Jennifer Lawrence really took the everywoman thing to the next level when she blended into the bridal party at her brother’s wedding. You know, aside from being on the cover of Martha Stewart Real Weddings, it looked like a typical wedding shot, down to the blush J. Crew dresses. But in 2016 the four-time maid announced she was hanging up her convertible frock for good. 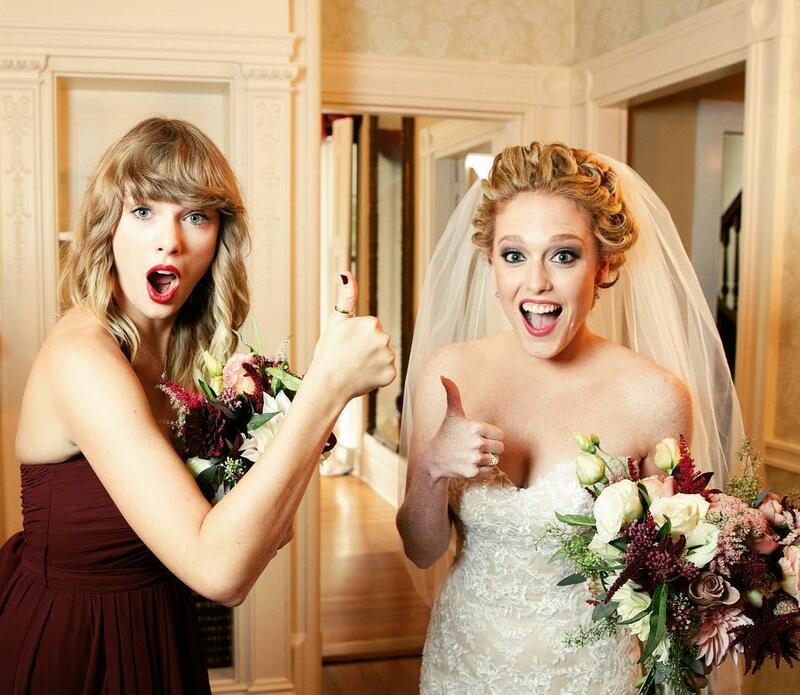 "Weddings rock, but I will never be a bridesmaid again," she told Vanity Fair. "There needs to be a bridesmaids' union. It's horrendous. If anyone asks me again, I'm going to say, 'No. That part of my life is over. I appreciate the ask.'"